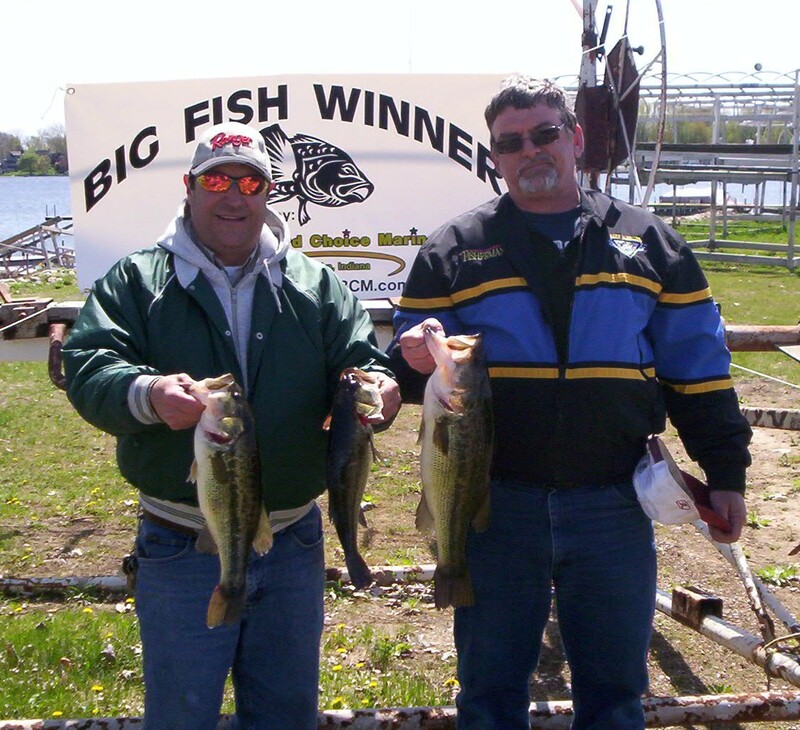 1st Place: Joe DeNardo (left) & Rick Ponder of Crown Point, Indiana, won the event with 16.02# of largemouth bass ($413) including a 5.92# toad to also win the Starboard Choice Marine Big Bass Award ($180)! The fish were caught with a green sunfish 3/8 oz Max Jig. Someone must tell Rick Ponder to smile after catching a monster like this! 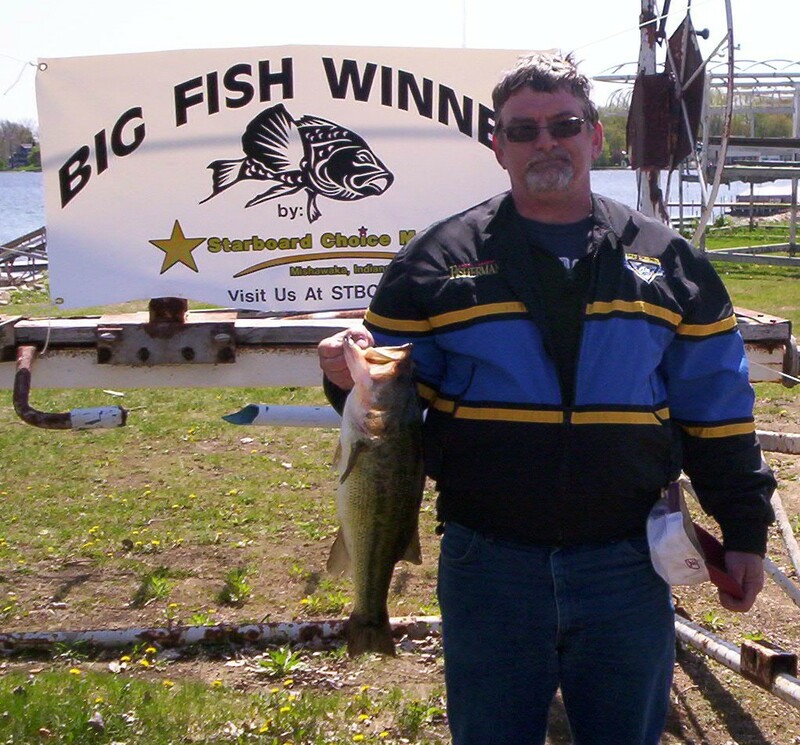 This was Rick's first experience with tournament fishing and he landed a 5.92 pound giant. One would imagine he will be back for more. 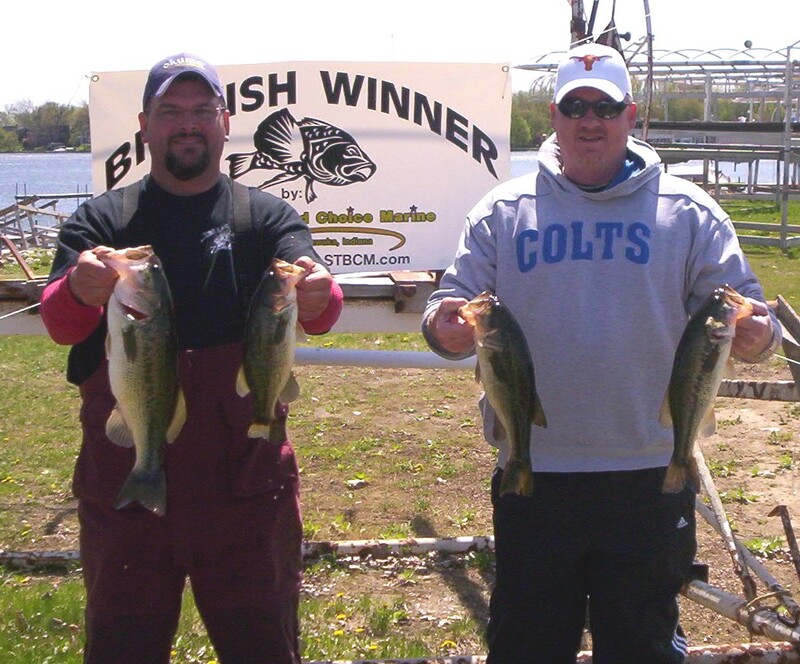 2nd Place: Aaron Hochstedler (right) of Greentown, Indiana, and Bobby Nelson of Fulton, Indiana, finished in with 4 fishing weighing 11.38# ($293). They were anchored with a 4.73# largemouth. The team used a combination of Lucky Craft Pointer 78 jerkbaits and Koppers lipless crankbaits. 3rd Place: Ryan Spicer and Chris Kaiser (left) caught the only other limit of fish using a combination of Erie darters and Aruka Shad lipless crankbaits. Their limit weighed 9.52 pounds. 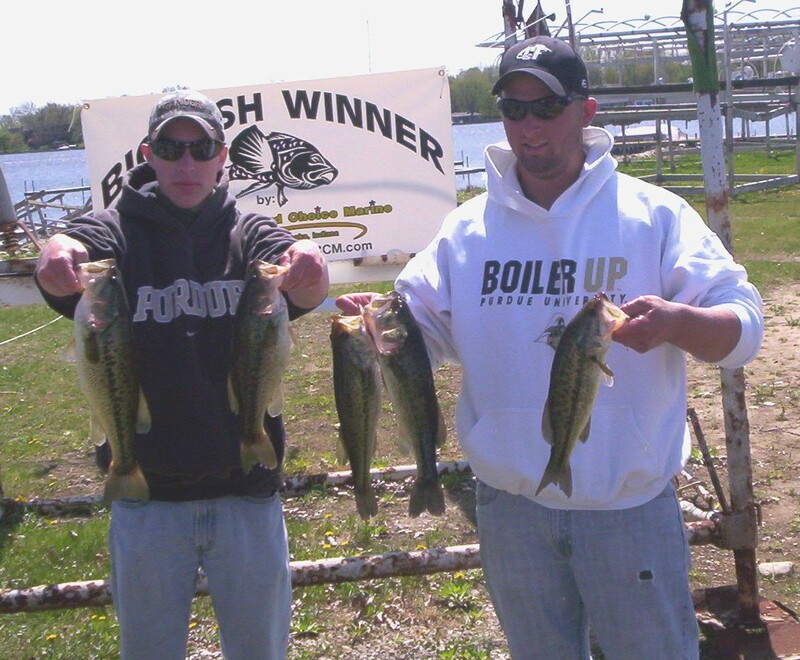 The Purdue Bass Team members finished 3rd earning them $211. 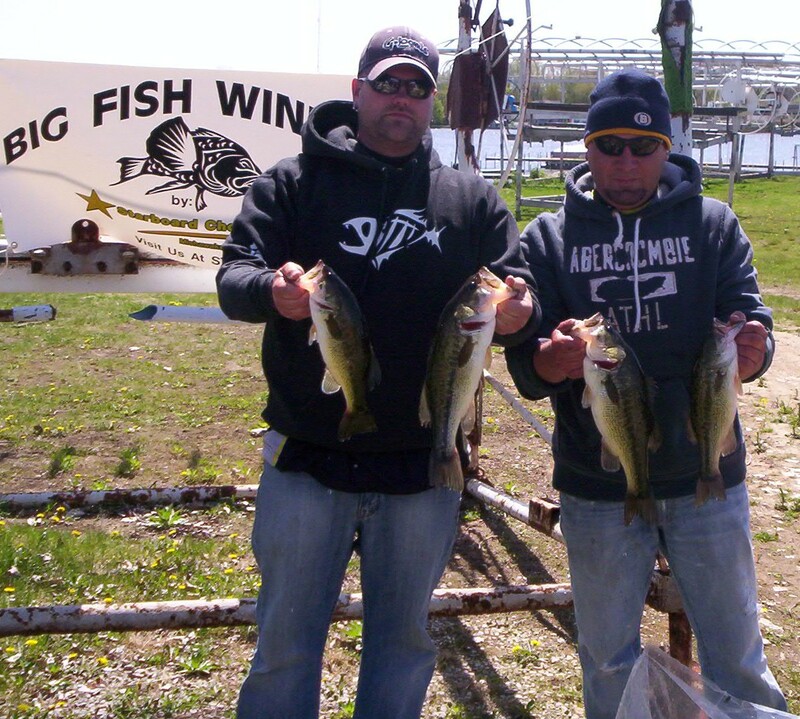 4th Place: Phil Strakowsk (right) and Jason Fowler finished with 4 fish that weighed 8.16 pounds. They spent their time chasing bedding fish in the channels. 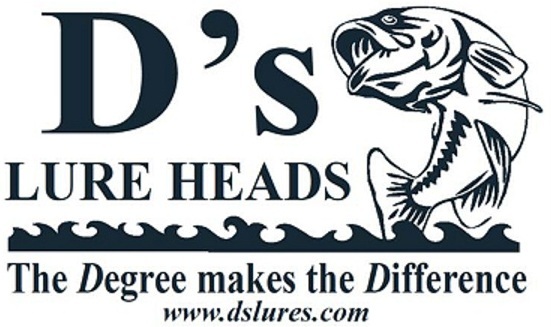 Their success earned them the D's Lures Award. 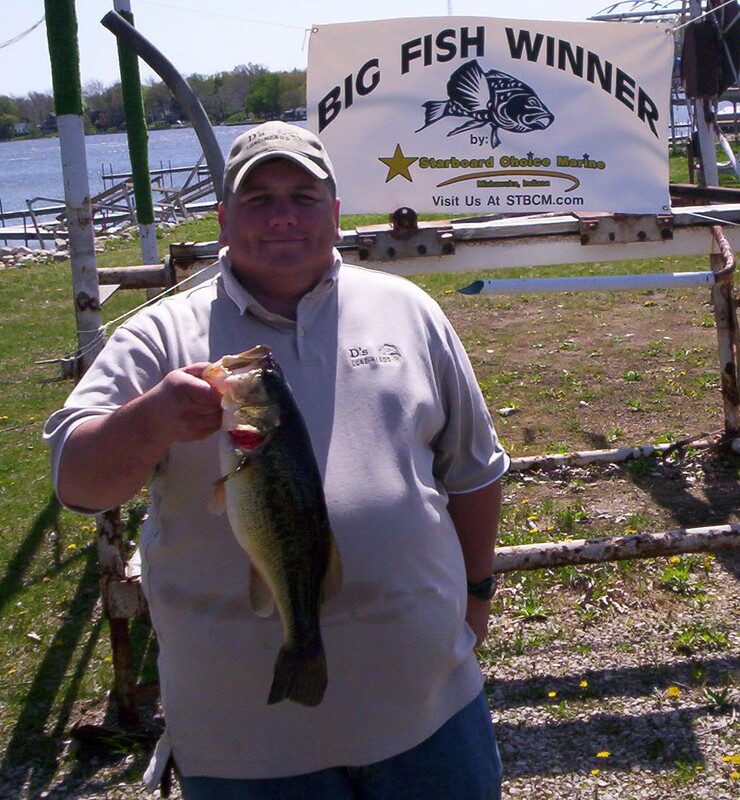 5th Place: Mark Fennell of LaGrange, Indiana, fished solo and landed this 3.94 pound fish. The fish fell victim to a D's Lures tube and tube jig. The first ever R & B Bass Circuit tournament was a huge success by all accounts. Participants came from as far north as Michigan as far south as Kokomo, Indiana. The fishing, however, was less than good for most. The outlook was bright as the area had been blessed with several days reaching temperatures in the 80s. This made the fish active and drew many into the channels to think about spawning. However, a nasty cold front with extremely strong winds blasted the area the 24 hours before the event. This gave a lot of fish a serious case of lockjaw. Nevertheless, several teams caught some good fish, but none more impressive than the first ever R & B Bass Circuit winners: Joe DeNardo and Rick Ponder. 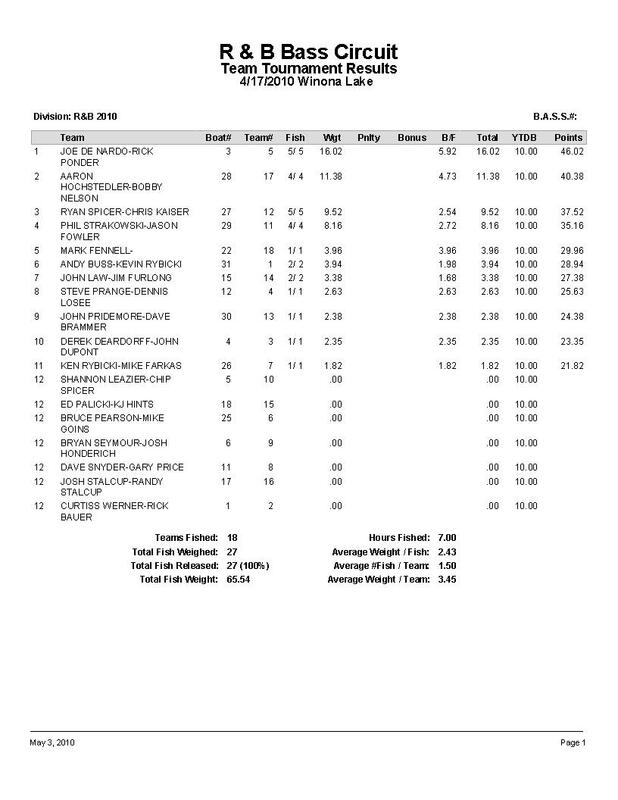 They crushed the field with 16.02 pounds. They won by nearly 5 pounds!